When the Japanese began their war in the Pacific, it was a style of warfare with which the West had never experienced or contemplated. No respect given to defeated enemies; no distinction made between military targets and medical facilities; and no hesitation to use atrocious violence, even in the face of unarmed and unresisting civilians. One by one, allied territories fell to the Japanese, the soldiers sent to labour camps, hell ships or simply murdered, but this is not their story. This is the story of the nurses, female support staff and families who never believed that the war would come to their tropical heaven. The story of the women in the war who expected to be treated with the respect and courtesy due them as medical officers of the Red Cross or simply as surrendered enemies who instead found themselves brutalised as badly as the soldiers, raped and herded into prison camps. There was no respite there either, the deliberate ignorance of the Hague Convention and the Geneva Convention led to squalid conditions in the camps, poor food supplies and regular waves of disease. Some, to escape the camps, took work as 'barmaids'. They were horrified to discover that they were instead to become Comfort Women, slaves in military brothels designed to control the spread of disease among the Japanese troops and keep them happy. Although the madness ended when Japan surrendered and the POWs were sent home, the effects of those nightmare years have stayed with them to this day. Howev er, these individuals have had to make do with barely any compensation from the Japanese and very little from their own governments all at the taxpayers expense. 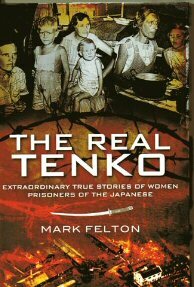 The Real Tenko documents the horrors visited on those who had nothing more than a desire to help people by a nation which officially denies anything contained in the book even happened. Though young, Dr Mark Felton, has already published several books on the Second World War in Asia and this book is sure to appeal to anyone with an interest in those areas or Prisoners of War in general.